When we think about the ruins of Greece, we most often see the remnants of the famous temples – the Parthenon for example. The first temples were made out of wood, but the transition to stone began in the late seventh century B.C. Limestone was used first and then marble. How were these stone temples built? 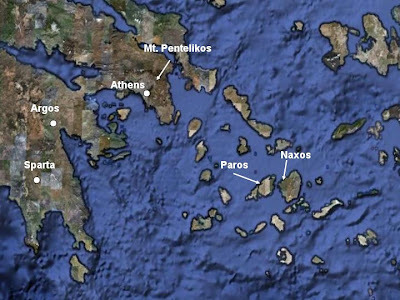 Primary sources for limestone and marble were Naxos and Paros; islands in the Aegean with quarries close to the sea. In the late sixth century, the Greeks began to work a marble quarry at Mt. Pentelikos. The map below shows the location of these quarries. Blocks of stone were transported by boat and when the situation required, ox cart. To avoid the risk of damage the blocks would be trimmed to rough size and finished at the site. 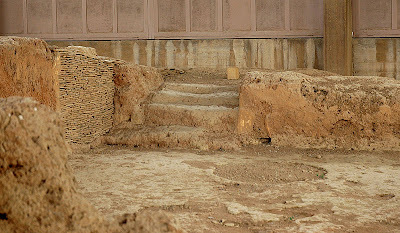 Stone shavings, resulting from the finish work, have been excavated from these sites. Believe it or not, limestone columns were turned on a lathe as a single monolithic block. The last columns made this way were used in the temple of Aphaia on the island of Aigina in the early fifth century B.C. The monolithic column was then replaced with those built in sections called drums. The drums were held together with wooden dowels. Stone pieces were finished at the building site with a claw chisel and hammer. They were then rubbed and polished to a smooth finish. Blocks were lifted into place using a block and tackle to get them close to a final position and then moved to final position with crowbars. Surprisingly, Greek temple architecture was not innovative – meaning it was not able to adapt designs to new materials and overcome structural limitations. The basic temple design was vertical support of horizontal beams. Architrave blocks were supported at their ends by columns and the roofs were supported by wooden beams resting on the entablature. 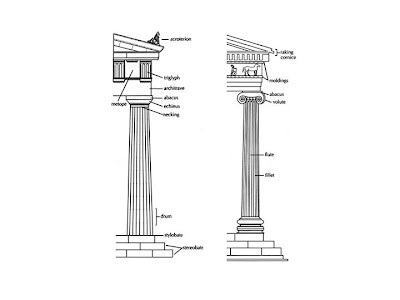 Column spacing could only be as large as the largest block on the architrave (4.5 meters in the Parthenon). Equally restricting are the wood beams which were limited by available timbers to about 12 meters. The archaic ruins at Lerna in Southern Greece were a stunning discovery in 1952 when John L. Caskey unearthed these oldest ruins in Greece. The centerpiece of the site is the House of Tiles, which is the oldest of of the five periods of ruins there. To put the age of this structure in perspective, let’s look at a Greek history chronology. 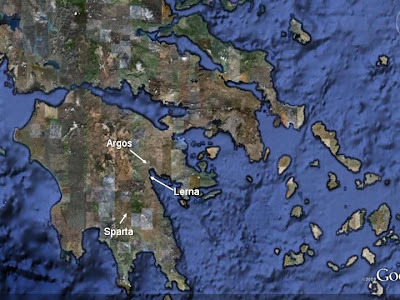 Lerna was a town on the coast of the Aegean Sea south of Argos. The map below shows its location. 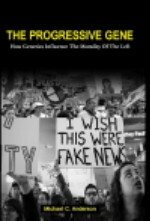 There is substantial myth to be found in Lerna. The town was home to the Lernaean Hydra, a water snake killed by Hercules. Lerna was also one of the entrances into the underworld and the ancient Lernaean Mysteries of Demeter were celebrated there. The House of Tiles was constructed around 2200 B.C. as a mansion for a chieftain or possibly an administration building. The building was two stories high, made of yellow brick on a stone foundation, and the roof was covered with terra-cotta tiles. It was destroyed by fire and the site was never re-built possibly out of reverence for the significance of the structure. The photograph above shows the ruins. Photo courtesy of Heinz Schmitz. 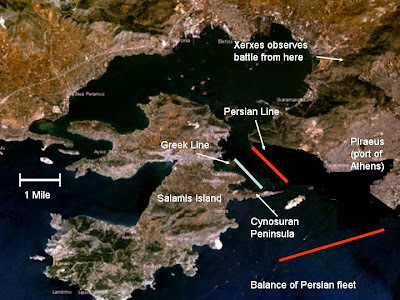 Following the Battle of Salamis wreckage from sunken Persian ships was blown westward and washed up onto the Attican shoreline at a place Herodotus calls “Colias”. The primary warship of the Greek navy during the classical period was the Trireme – its name derived from the three rows of oars used for propulsion. The first documented use of this craft was 525 B.C. in a battle between Persia and Egypt. The trireme proved to be superior to its predecessor, the penteconter, which had fifty oarsmen. 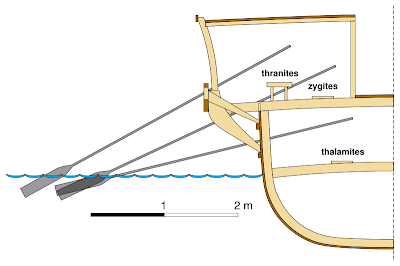 The drawing below shows how the trireme rowers were positioned. As you can imagine, practice was essential to produce a coordinated movement and avoid oar strikes. The Trireme was about 110 feet long and made out of softwoods (pine and fir) to minimize weight so that it could be carried by 140 men. The softwoods absorbed water causing the ships to lose speed, so they had to be brought ashore for maintenance periodically. The ship’s crew was about 200 Greek citizens (no slaves), made up of one hundred and seventy rowers, twenty or so hoplites, and ten officers. The ships had a main sail and foresail so improve speed during windy conditions. The ship could make four knots with half the crew resting or eight knots at maximum speed. 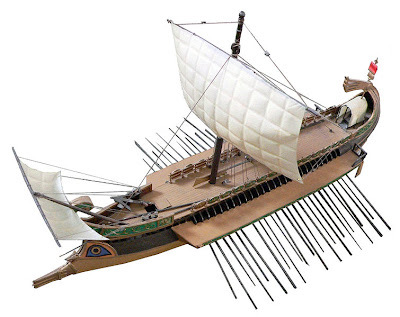 The triremes had a pointed prow which was designed to ram other ships and disable them. Battle tactics included ramming from behind or passing close to break the enemy’s oars. Boarding was an option but not often used until later because the marine contingent was too small. Usually the masts were taken down before battle to avoid a target for grappling hooks. Cross section drawing coutesy of Eric Gaba. 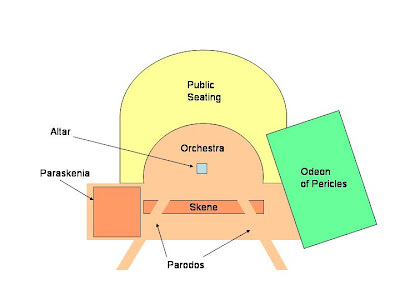 The drawing below depicts the structure of the Theater of Dionysus in Athens. The action occurs in the orchestra; a platform were the actors stood during performances. Since the Dionysian festival was religious in nature, an altar was located in the center of the orchestra for sacrifices. The Skene (original meaning “tent”) was a large wooden wall used for the backdrop. It could also be decorated as part of the set. The Skene was a substantial structure because it had to incorporate a lifting apparatus to be used to suspend actors in the air. In the case of one play, the entire chorus went to visit Zeus and “flew” to Mount Olympus. There were two (or three) openings cut in the Skene connected to long ramps called Parodos. These ramps were used for entrances and exits for the actors. The Paraskenia was a roofed building which housed the dressing rooms and costumes for the actors. Next to the public seating was a roofed building called the Odeon of Pericles which provided shelter in case of inclement weather. I looked at the many pictures of the Theater on the internet and few if any depict it as it was during the time of Pericles. Some show a Skene constructed out of stone, others a stage. These either represent later versions of the original theater or a reconstruction under the period of the Roman occupation. 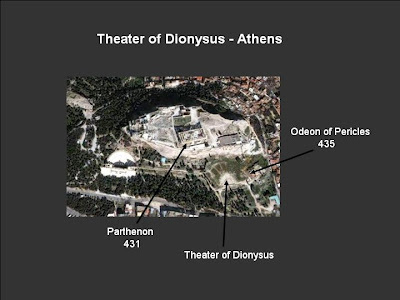 The picture below locates the Theater of Dionysus near the Acropolis in Athens. Most of the structures on the Acropolis were destroyed during the Persian invasion in 480 B.C. Construction of a new Parthenon was begun after the war but not completed until 431. The Theater of Dionysus was located on the southeast side of the Acropolis. Destroyed at least twice, the current remains are part of a Roman reconstruction. To its right is the Odeon of Pericles, a roofed structure designed for rehearsals and to shelter the public in case of inclement weather. The theater supposedly held as many as 17,000. According to historians, the ancient Greek people were made up of Dorians and Ionians; tribes who migrated from the north into Greece during the Mycenaean Era. 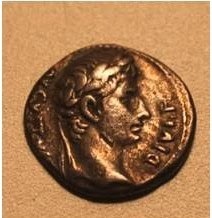 The Peloponnese was Dorian while the Attica Peninsula and the western coast of Asia Minor were populated by Ionians. Dorians had their own dialect of Greek and observed their own festival-laden calendar. Most people who know a little Greek history are familiar with the Dorian and Ionic columns of Greek Architecture. The Greeks used these designations to relate each type to its ancient race, although it is not clear whether there was any connection. Doric columns were used in mainland Greece and Sicily: Ionic in western Asia Minor. The most famous Greek temple, The Parthenon, is constructed in the Doric style. The Doric order is older and more simple than the Ionic. The use of a Metope (square block of stone between Triglyphs) may have been part of a transition from wooden buildings which the space occupied by the Metope was the opening between two roof beams.